Boston, Feb. 7, 2018, — Many Asian American voters celebrated today as the Asian Disaggregation bill H3361, in its current form, was rejected by the Joint Committee on State Administration and Regulatory Oversight in the State House. 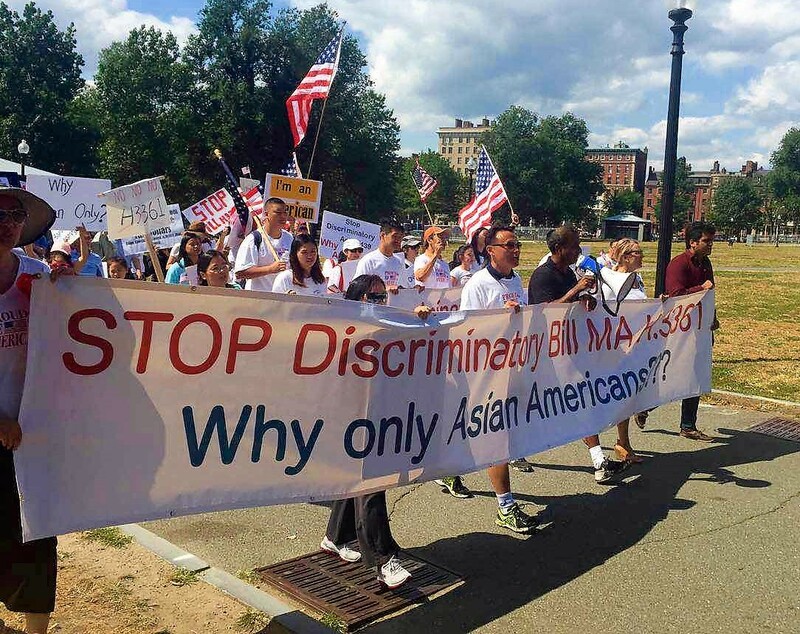 Thousands of Asian American voters have protested against this bill over pass seven months. A protect against H3361 in August 2017 (bostonese.com file photo). Bill H3361 would requires “all state agencies, quasi-state agencies” to identify Asian Americans in all data collection, reporting and verification. The Bill further requires the reporting of disaggregated data on the five largest Asian American ethnic groups. It has been met with protests and strong condemnation from Asian Americans since State Rep. Tackey Chan of Quincy proposed H3361 in Jan. 2017. “Why only Asian Americans?” many protesters asked. Protesters outside the State House on Jan. 30, 2018 (bostonese.com file photo). Close to 1000 of people attend the hearing on H3361 on Jan. 30 in the State House to voice their oppersition to this bill. They feared that such a bill would create a defesto Asian American registry that would violate their rights to privary and equal protection. Hundreds made phone calls and wrote emails to their state reps over last couple days to voice their concerns and oppersition to H3361. “We gained a lot in learning the political process opposing this bill. We just stood up for ourselves and don’t let politicians to decide what the best is for us,” an Asian American voter said upon learning the defeat of H3361. This legislation would establish a special commission to study the feasibility and impact of directing state agencies to collect disaggregated demographic data for all ethnic and racial groups, as defined by the U.S. Census Bureau. The proposed special commission would be comprised of 11 commissioners, including legislators, as well as members of the Governor’s Advisory Commissions, and appointees from the Attorney General’s Civil Rights Division, the Executive Office of Health and Human Services, and the Secretary of the Commonwealth’s Office. The commission would submit its recommendations to the Legislature by December 31, 2018. I had concerns about the original legislation from the start, but every bill must have and deserves a thorough process in committee and in the hearing room. I was disappointed at the vitriol aimed at Chairman Chan, Chairman Timilty, and myself from some opponents of H.3361. It was inappropriate and damaging to this process. I am appreciative of those who conducted themselves with civility while delivering passionate testimony.